Even before the undercard had started at the “Fight of the Century,” a nasty dispute ensued, with Rachel Nichols of CNN and Michelle Beadle of ESPN squaring off against the Mayweather camp, particularly his publicist, Kelly Swanson. The basics were that Nichols and Beadle said they were told they had been denied credentials. Amidst the outrage that ensued, Swanson emerged claiming that they had indeed been issued credentials and that their claims to the contrary were false. You can get details on the actual conflict in this account by Richard Deitsch of SI.com. But let’s also think about what this tells us about the professional practice of public relations — as demonstrated by Swanson and, in contrast, how it should be done. Although she is considered one of the most powerful people in boxing, male or female, most non-boxing fans would not be familiar with her. This profile from the Buffalo News might have given journalists more hope about how she would have handled the situation with Nichols and Beadle. But Nichols brings some credibility to the table on this. Many in the audience — and I daresay most in the profession — would be inclined to accept Nichols’ version of events. If the person involved were Geraldo Rivera or Clay Travis, then of course their claims would be greeted with some skepticism, given their reputation for self-serving promotional scams. But Nichols has earned more respect than that. Some PR folks also have a reputation for credibility, maintained under fire. One close-to-home example is Kirk Sampson, long-time SID at Auburn. Even during the height of the flames in the Cam Newton controversy during the 2010 season, Sampson cemented his reputation for respectful, ethical professional behavior, as this Deadspin report pointed out. Some reporters were as skeptical toward Auburn as Nichols and others were toward Mayweather’s treatment of women. But Sampson maintained a level head and afforded courteous treatment to all requests. It was a side issue, but some wondered whether Beadle deserved the same treatment as Nichols, because Beadle has a different reputation within the media. But that is another mark of a professional public relations practitioner — equal respectful treatment of all in the media. You might not have enough seats on press row for everyone, but you have an unlimited amount of respect and courtesy to show each media member. In this case, it is a false distinction to think that Beadle should be accorded less courtesy than Nichols because Beadle is a host of an ESPN2 program rather than a reporter for CNN. Given the available facilities, Beadle deserved better treatment. Of course there is going to be a “pecking order” for media attention; sports figures have only so much time available for the media, especially during the season. But the most respected media relations folks do everything they can even for smaller media outlets. It gets tricky with the emergence of blogs and podcasts, requiring even more media savvy by the public relations folks. But they understand that as part of their job. The above Buffalo News feature notwithstanding, Swanson definitely lost credibility. Her account, as described above, simply does not ring true. At once, she acknowledges that Nichols got bad information, then seems to discount its importance. It would be more appropriate for Swanson to acknowledge the misunderstanding or miscommunication, and then to go the extra mile to make sure Nichols and Beadle were accommodated. It might have taken some phone calls and direct contact from Swanson to Nichols and Beadle, but it was her office that had created the confusion, so it was her responsibility to clear it up directly — not through Twitter or the media. 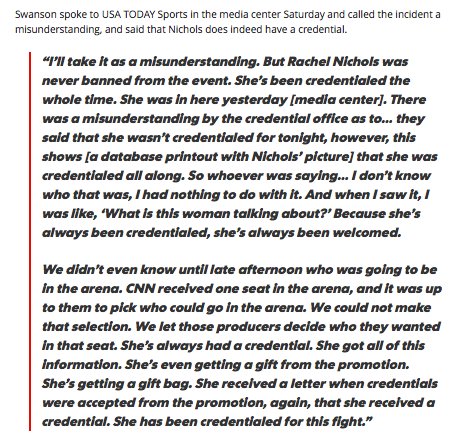 But for Swanson to claim that Nichols was always credentialed implies that Nichols was not telling the truth. It’s difficult to imagine Nichols’ motives for lying. She had more to gain by being at the fight as a credentialed journalist than leaving, indignant and jilted. Given that Mayweather and Swanson were not pleased with Nichols’ grilling of the fighter during an earlier interview, the situation came off as payback, draining believability from Swanson’s explanation even further. My master’s degree was in public relations, and my last job before I started teaching was as a public relations director for Azusa Pacific University, a private liberal arts university in Southern California, in the early 1990s. My policy was always that I would never lie. As the person who submitted the statistics for the U.S. News and World Report’s college rankings, I never “cooked” the numbers. It’s not a PR professional’s role to do the media’s newsgathering work for them, either. When seven APU students were diagnosed with hepatitis, I did not contact the media to announce it. At the same time, our office had everything in place so that when the first journalist contacted us (thank goodness none ever did), we were ready with full disclosure — a release and fact sheet, the dean of students as chief spokesperson. We were not going to lie about it. It’s one thing to keep internal information private, another to intentionally mislead, as Swanson seemed to do in her explanation. No doubt Swanson is well paid for her work with Mayweather, and some superstar athletes might consider the truth to be theirs to call for their public relations folks. But Swanson’s credibility is hers to maintain, and any public relations professional must determine with his or her perceived honesty is up for bid. No doubt some athletes would be relieved that their publicist would go to such lengths to keep them from unpleasant questions. If she’s looking to expand, Swanson will gain well-paying clients, impressed at her willingness to take on reporters like Nichols. ← Can Jason Whitlock Coach The Undefeated?